The older Swiss keep an amused eye on their Austrian neighbours: they speak a sort of German, are charmingly corrupt and feed off the relics of their imperial past quite well. They are the objects of the better Swiss jokes and their own humour is viciously self-deprecating, the humour of the people of a small country still chained to the cannonball of 800 years of imperial history. They are always good for a cheerful surprise. Today's surprise comes courtesy of the Austrian Post, which has just set up an online merchandise shop [DE only]. Why a postal and financial organization should want to get into online shopping is another one of those many Austrian mysteries. It is, however, a very special online shop: it only sells products from Austrian merchants. The shop has been explicitly created to favour Austrian suppliers over foreign or international sales platforms. It is a patriotic online shop. The really patriotic can get a Lederhose (999 EUR!) or a Dirndl (499.95 EUR! ), but, in order not to descend into complete irrelevance, non-Austrian products that Austrians might want such as iPhones and Tommy Hilfiger beach shorts are available too, but supplied by Austrian retailers. The shop doesn't say explicitly that it is only open to Austrian customers, but since it only delivers to Austrian addresses and only takes payments from Austrian bank accounts, it doesn't need to. So far, so harmless. You can still buy your leather shorts from international online sites if you wish. A bit of an extra web presence for the unglobalised locals can only be a good thing, can't it? Well, yes and no. Some things Austrians can buy from the Austrian Post. Left: Firma Sportalm: Dirndl 'Innersee'. 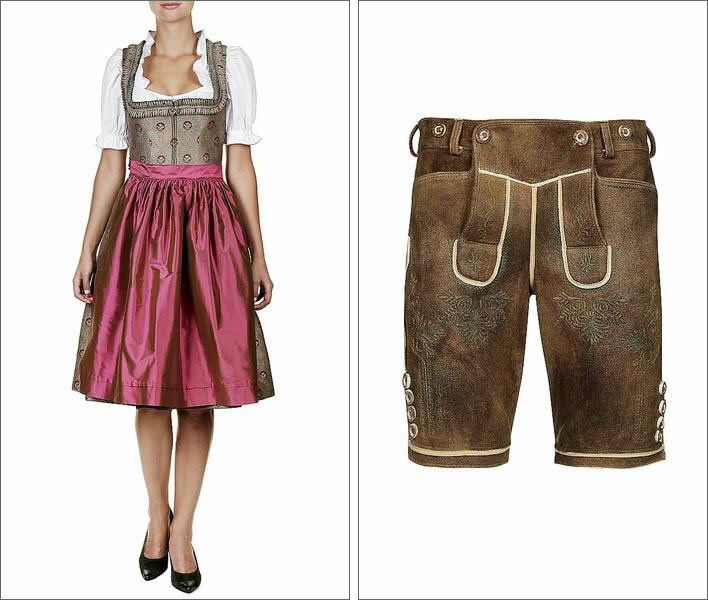 Right: Firma Weinbauer: Lederhose aus Rothirschleder [red deer leather] 'Altausee'. The obvious absurdity of the project has its own slightly corrupt Austrian flavour. The entrepreneurial manufacturer of Lederhosen and Dirndl can use Amazon, for example, as a platform for selling its products and reach a worldwide market: Americans, Chinese, Japanese and many others would love the Maria and Captain von Trapp models. Americans particularly would value the concealed-carry possibilities of the Lederhose. Access to these international platforms is cheap and easy. The danger to the Austrian economy of its citizens buying cheap folkwear from China seems overstated. [The shop] is being advertised with nationalistic slogans: 'Say yes to Ö! [Austria]' it tells you. [It asks] whether you have ever thought about the fact that through online shopping 'every year hundreds of millions of Euros disappear from Austria'. But now that can be changed, it says, because on shoepping.at only Austrian retailers and producers sell their wares, 'so that our money stays in our country'. The sentiments expressed in this video could come from any of the Habsburg emperors. We think of Maria Theresia in her much mocked 'Viennese Commandments' of 1749 attempting to stop the flow of money out of the empire caused by rich ladies importing too many grand frocks, or of her son Joseph II, the mad micromanager himself, who arguably caused thousands of deaths from starvation during the terrible hunger years of 1770-1773 by his frantic mercantilist meddling in grain prices and quotas –	there were quotas and restrictions even between the internal provinces of the Empire. That such eerily similar thoughts are coming out of Austria in 2017 feels very strange. When they hear the name Austria, those who take an interest in economics will immediately think of the 'Austrian School' of economists, believers in free-trade and small government and consisting of great names such as Ludwig von Mises and Friedrich Hayek. Two things have brought great blessings to the world in the last half-century: technical progress and the reduction and removal of barriers to free trade between nations. The peoples of the world are multiplying, prospering and living longer because of trade. But let's not take it too seriously – this is Austria after all. The NZZ correspondent needs to loosen up a little. As any student of Austrian Economics knows, the market will take care of this folly extremely efficiently. From long experience of living there the Austrians themselves know this already, as evidenced by the fine, thoroughly Austrian sarcasm in the comments to the video advertisement on YouTube. The general consensus being that it is yet another Government project designed for the consumption of taxpayers' money and with a probable lifespan of two years. Relax! Order another großen Brauner and ask for the dominoes.